The large building complex of the Vienna Hofburg Palace was built between the 13th and 19th centuries. For six centuries up to 1918 it served as Imperial Palace and home to the Habsburgs. Over time many parts, each sporting a different architectural style were added to the complex. Constructed as ballrooms in 1705, the Redoutensaele have a longstanding history. Empress Maria Theresa had the Redoutensaele remodelled in 1748 by Jean Nicolas Jadot de Ville-Issey, the façade bears the signature of Nicholas Pacassi and Franz Anton Hillebrandt. Numerous concerts and "Redoutes" (masquerade balls) as well as the wedding banquet of Joseph II. took place in these halls. Upon the marriage of Archduke Franz with Maria Theresa, Antonio Salieri had the great honor to assemble the music in this very place. On March 29, 1828 the famous master violinist Niccolo Paganini gave a concert at the Redoutensaele. Otto Nicolai conducted on March 28, 1842 a concert with the "Philharmonic Academy", which is rightly regarded as the birthhour of the Vienna Philharmonic. On 27 November 1992 the Redoutensaele were seriously damaged by fire. The reconstruction and restoration work performed took five years. While the smaller of the Redoutensaele which was less damaged was faithfully restored. For the large Redoutensaal a design competition was held, which was won by the Austrian artist Josef Mikl. He created a number of oil paintings based on literary quotations taken from Ferdinand Raimund, Johann Nepomuk Nestroy, Elias Canetti and Karl Kraus. The Festsaal is the largest hall in the Hofburg. It was originally designed as a throne room, but never used as one, the interiorwas finished in 1923 but the design remained incomplete. Three ceiling paintings by Alois Hans Schramm glorify the Habsburg rule. Under the motto of Emperor Franz Joseph "Viribus Unitis", join forces. In the lunettes Eduard Veith and Viktor Stauffer have immortalized personalities from Austrian history. The central picture represents Austria surrounded by allegorical depictions of religion, justice, courage, science, art and agriculture. The lunettes by Veith show significant Habsburg rulers. In the lunettes by Stauffer one can see among others, commander Karl of Lothringen, the polish king Jan Sobieski, field marshal Prince Eugene of Savoy, state chancellor Prince Kaunitz and Prince Metternich. The ceremonial hall is the most magnificent hall at the Imperial Palace. The Belgian Architect Louis Montoyer designed the hall between 1802-1806 as a throne room on behalf of Emperor Francis II. The magnificent coffered ceiling is supported by 24 round columns made of artificial marble, at the time the fashionable "stucco lustro". 26 crystal chandeliers, that used to accomodate 1.300 candles, gave the ceremonial hall imperial splendor. It was here that Napoleon courted the daughter of Emperor Franz II., Marie Louise. The famous "Court Ball" also took place here, it was a ball reserved for Aristocracy. On Maundy Thursday Emperor Franz Joseph and Empress Elisabeth invited twelve poor old men and women for the traditional foot washing. It was a ritual honoring religious customs and the people of Austria. It served as a throne room until the end of the Austrian monarchy in 1918. 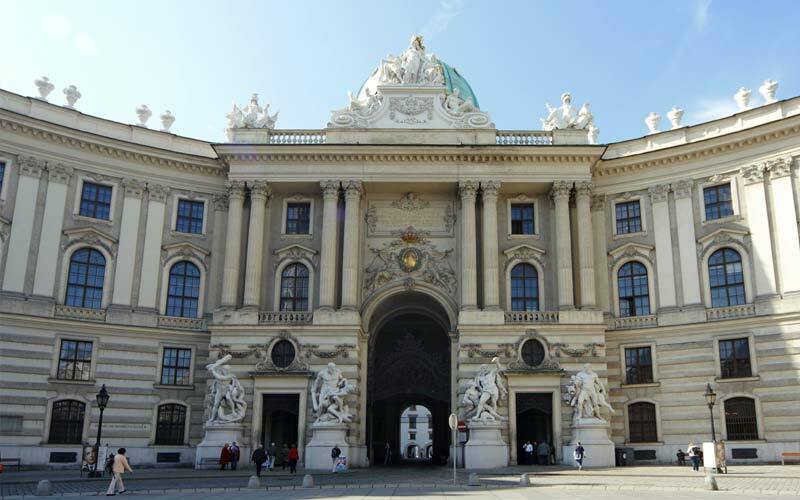 The Vienna Hofburg Palace is only a short walk away from the subway station Volkstheater of the subway lines U2 and U3 and from the station Museumsquartier of the subway line U2. Also the tram lines 1, 2, D, 46 und 49 and the busline 48A have a station at Dr. Karl Renner-Ring which is close to the Hofburg Palace.